The novel opens on a train platform in 1929. The Pembertons have just married in Boston and arrived at the logging settlement in North Carolina where Mr. Pemberton is part-owner. Awaiting them is Rachel Harmon, single and pregnant with Pemberton’s child, along with her father and his very large knife. But he is no match for Pemberton. Formidable enough on his own, Pemberton and his mysterious new wife make an unstoppable team. Serena has grand plans for their business and will stop at nothing to make sure those plans are realized. Woe to anyone who gets in her way. The eerie backdrop – clearcut forests, loggers being maimed and killed – lends to the harsh atmosphere. 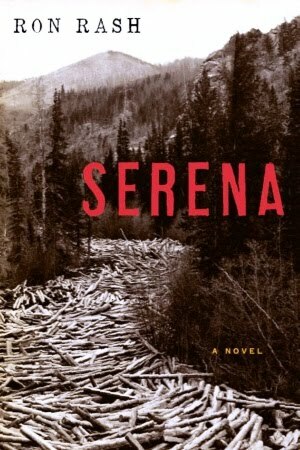 Serena, who obtains an eagle and trains it to do her bidding, is herself like some wild animal. I heard about this book from Jennifer Weiner’s blog but despite the promising start, it wasn’t as heartstoppingly exciting as her review suggested. It was a good story, but I didn’t get to know the characters enough to care about them. I was sympathetic to single mom Rachel, but everyone else seemed two-dimensional and emotionless, with few redeeming qualities. Weiner mentioned Serena not having a backstory, which was frustrating, but I also found Pemberton hard to understand. He is totally entranced by her, but it doesn’t fully explain why he allows her to take charge to the extent that he does. Presumably he had a backbone at one time in order to rise to such heights in business, yet once Serena arrived he let her take complete control without questioning it at all. On the one hand, I know the writing is good in many ways. But on the other hand, it wasn’t a book I was dying to pick up every time I had a free moment. There were some parts that were compelling, but I didn’t feel a consistent pull towards this novel.